Hollywood loves to turn the tables on its own hackneyed formulae. For decades, Native Americans were on an endless warpath in the movies, getting up in the morning with only one item on their “to do” list: namely, mount yet another attack on gnarly ranchers and the occasional wagon train. But these days, the Indians in the popcorn palaces are laid back; sage and sympathetic. Overturning cliches always plays well, because doing so allows filmmakers to meld helpful familiarity (you know how these guys are supposed to behave) with surprise (they’re not conforming to type). 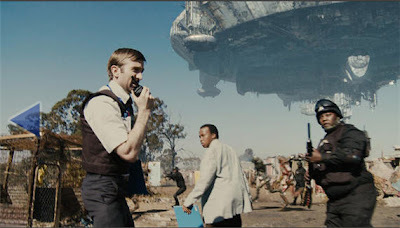 In “District 9,” a hubcap-shaped alien mother ship – looking like a kit bash of a few thousand Revell model tank parts – comes to Earth and stalls over Johannesburg. The confused occupants disembark, and quickly confront their South African hosts with yet another social problem (as if the country needs one). Where do we put these dudes? Next post: All About You!